It was the intrepid Lady Mary Wortley Montagu who first proposed that ‘the world consists of men, women, and Herveys.’ So it has remained ever since, although the inspiration for Lady Mary’s remark was, of course, that most mercurial creature of early 18th century England and confidante of George II’s spouse Caroline, John, Lord Hervey. The queen found him ‘particularly agreeable, as he helped to enliven the uniformity of a Court with sprightly repartees and lively sallies of wit.’ Speaking of which, if Hervey’s memoirs (which were only first published over a century after his death) are not quite up to the mark of those by his French near-contemporary the Duc de Saint-Simon, nevertheless they offer an insight into the intrigues of political and social life at the time, and also explain why he inspired as much loathing as love. Despite his innumerable affairs with women and men alike, and his general weak health (for which his father blamed ‘that detestable and poisonous plant, tea, which had once brought him to death’s door, and if persisted in would carry him through it’) Hervey and his loyal wife nevertheless managed to have eight children, among them Frederick Augustus Hervey, Bishop of Derry and Earl of Bristol. Frederick Augustus Hervey was born in August 1730 and as the third of Lord Hervey’s four sons was not expected to inherit either the family title or lands. He therefore needed to find an alternative career (two of his brothers joined the armed forces, one becoming an admiral, the other a general) and so became a Church of England clergyman. Thanks to the intervention of his eldest brother George who as second Earl of Bristol in 1766 was appointed Lord Lieutenant of Ireland (although he never visited the country), Frederick Augustus – already a royal chaplain – was appointed Bishop of Cloyne. A year later, aged only 38 he became Bishop of Derry and thus responsible for one of the richest Irish sees. Judicious management of diocesan funds allowed him not only to increase his wealth but also to ensure that some portion of the Bishop of Derry’s estates in would pass to his own heir. It is difficult to discern the depth of Bishop Hervey’s personal religious beliefs, but there can be no doubt about his tolerance: he was a proponent of religious equality and dedicated himself to improving the lot of Roman Catholics and Presbyterians within his diocese, and further afield. He campaigned to place on the statute book an oath of allegiance which would permit loyal and well-disposed Irish Catholics to disavow the more extreme papal doctrines – such as the teaching that heads of government excommunicated by the Pope could be deposed or murdered by their subjects. In 1774 an oath along the lines he had been suggesting since 1767 was incorporated in an act of the Irish parliament (it was then spurned by the Papacy). 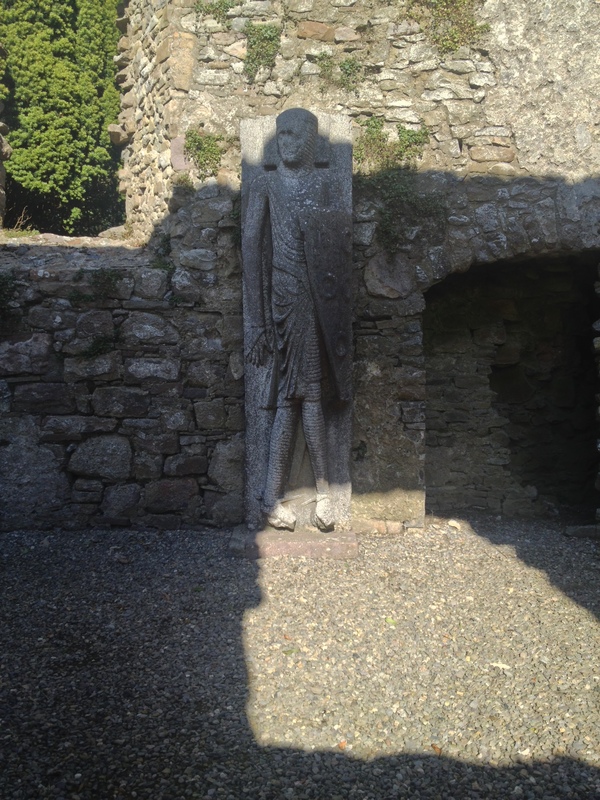 But he was also somewhat eccentric – he was, after all, a Hervey – and on one occasion he organised a curates’ race along the sands of Downhill, the winners being awarded benefices then vacant in the Derry diocese. One of the ways Hervey practised private cabal was by becoming over-involved with Irish politics. His sympathy for the plight of Catholics led him to take an interest in parliamentary reform and even, it has been suggested, in the notion of independence for Ireland as would be attempted before the end of the century. However, by that time, following the death of two brothers he had inherited the Earldom of Bristol and with it considerable estates in England that increased his already great wealth. Even before becoming Earl of Bristol in 1779, the Bishop had been a great traveller on mainland Europe: it is often said the reason so many Hotels Bristol exist is that they were named after him. In particular he loved Italy, a country in which he spent more and more time as he grew older (he would die in Albano in July 1803). Here he collected the many artworks intended to fill great houses built for him in these islands. So all consuming was his passion for translating architectural ideas into reality that he became known as the ‘Edifying Bishop.’ He was responsible for two new residences in Ireland, the first and more conservative being Downhill, County Derry. 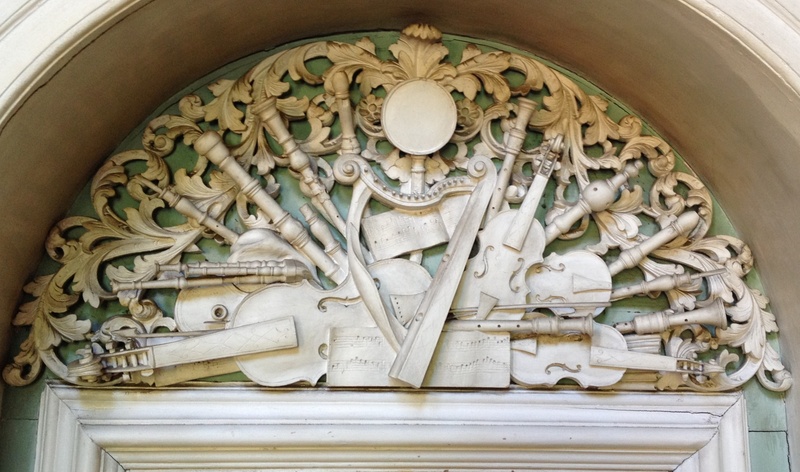 It dates from the mid-1770s when work started under the supervision of a Cork-born stone-mason Michael Shanahan, perhaps to a design by James Wyatt. Located close to a cliff overlooking the Atlantic Ocean, the house is long and narrow and of two storeys over basement, its granite ashlar exterior relieved by a series of bows and giant fluted Corinthian pilasters. Long wings on either side (originally concluding in domes) flank a central courtyard and this in turn leads to a further extensive range at the rear, allowing all services to be kept on the one site. 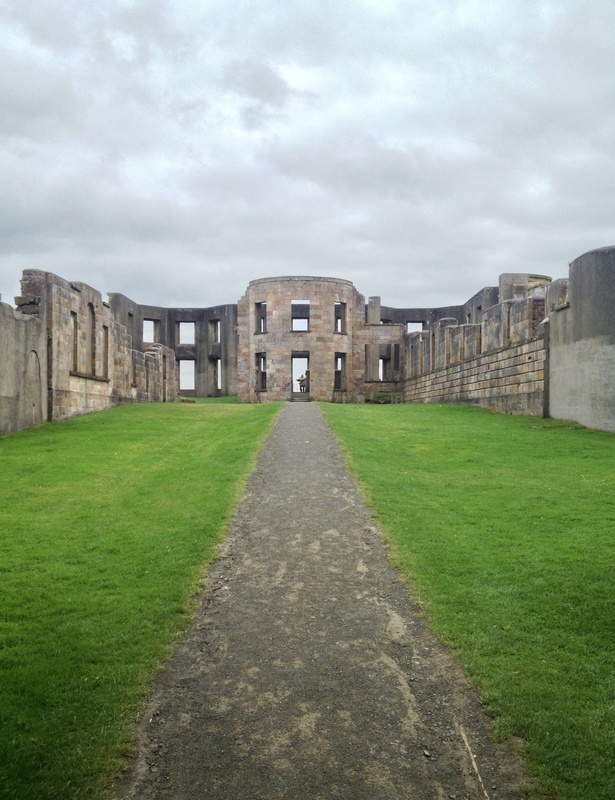 Downhill is highly exposed to harsh winds whipping off the nearby seas and was always cold but at the time of its construction Hervey wrote enthusiastically to one of his daughters that the place ‘is becoming elegance itself, with 300,000 trees…and almost as many pictures and statues within doors.’ Indeed the interiors were said to be magnificent, the principal stone staircase having a balustrade of gilded ironwork beneath a frescoed dome while the main rooms were a library and double-height picture gallery, at one end of which were pairs of Corinthian columns supporting an entablature above which were the arms of the bishopric and earldom. 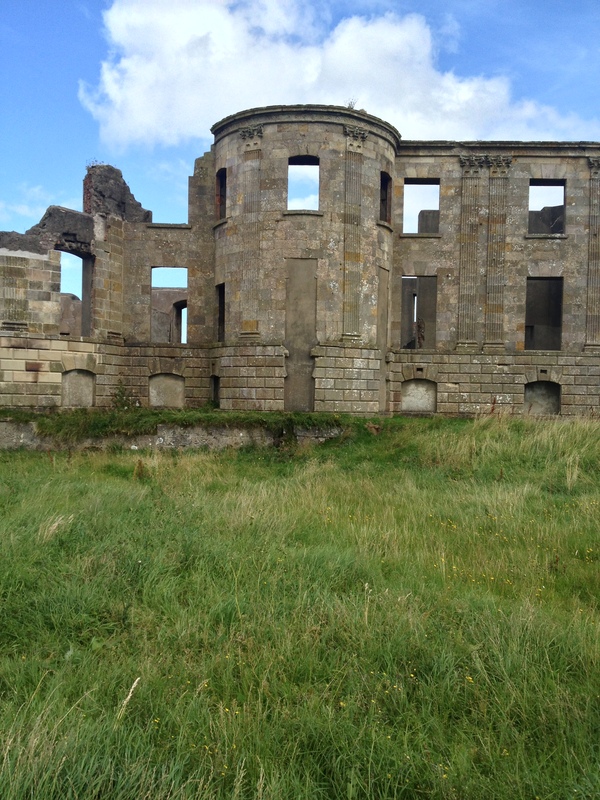 As can be seen from these photographs, little remains today of the Earl-Bishop’s splendid residence at Downhill. On his death he left the Irish estates to the Rev. 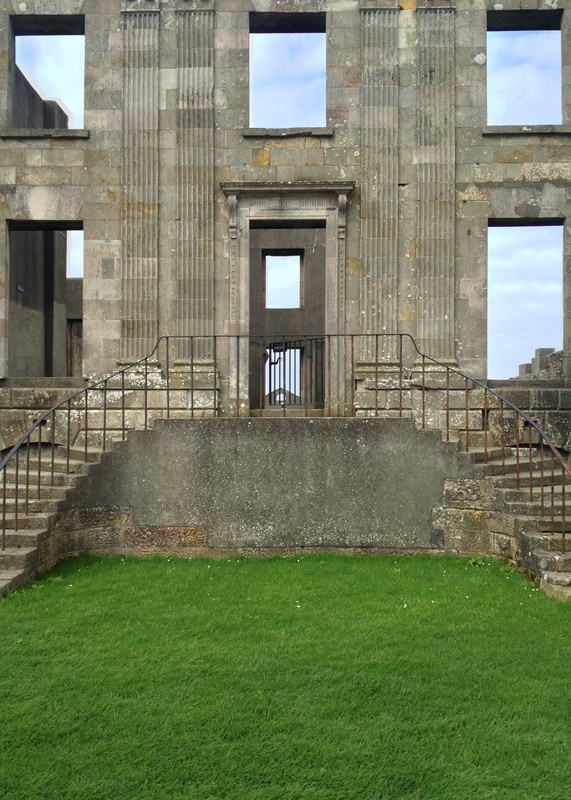 Henry Hervey Bruce, brother of a deceased cousin – Mrs Frideswide Mussenden – to whose memory the Earl-Bishop had built an exquisite domed rotunda in the grounds of Downhill, known as the Mussenden Temple. The Rev. Bruce, who became a baronet soon after coming into his considerable inheritance, had looked after both his benefactor’s property and diocese during the Earl-Bishop’s long absences from Ireland. 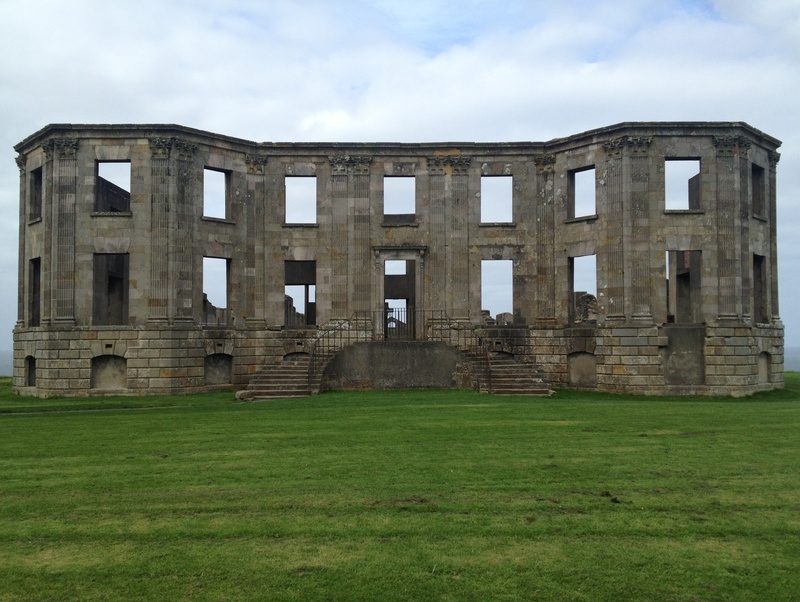 Generations of the Bruce family remained in possession of Downhill for the next 150 years but the house was seriously damaged by fire in 1851 when many of the most valuable contents, including its library and collection of statuary, were lost. 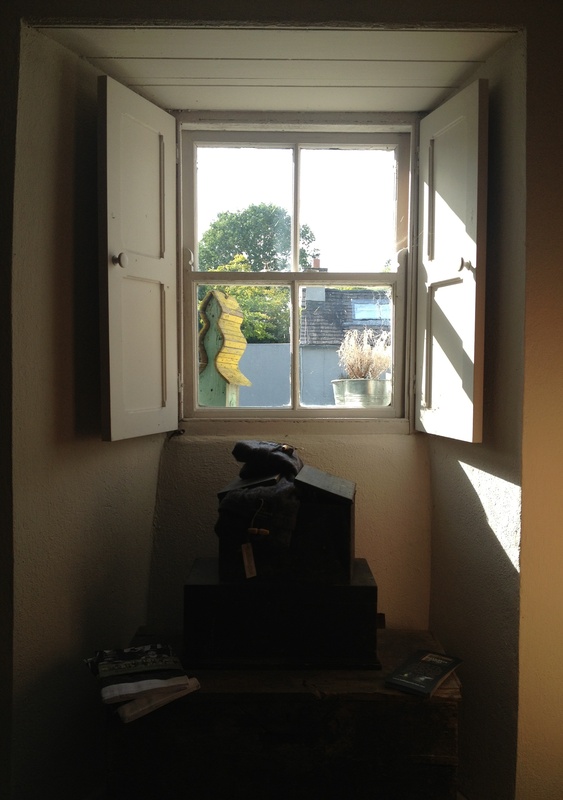 In the early 1870s a programme of restoration was carried out to the designs of John Lanyon, which involved a new entrance being created on the west side of the house and the installation of plate-glass windows as well as a new heating system since Downhill had hitherto been notoriously cold. But even these improvements could not save the house after a sequence of deaths led to heavy duties and sales. 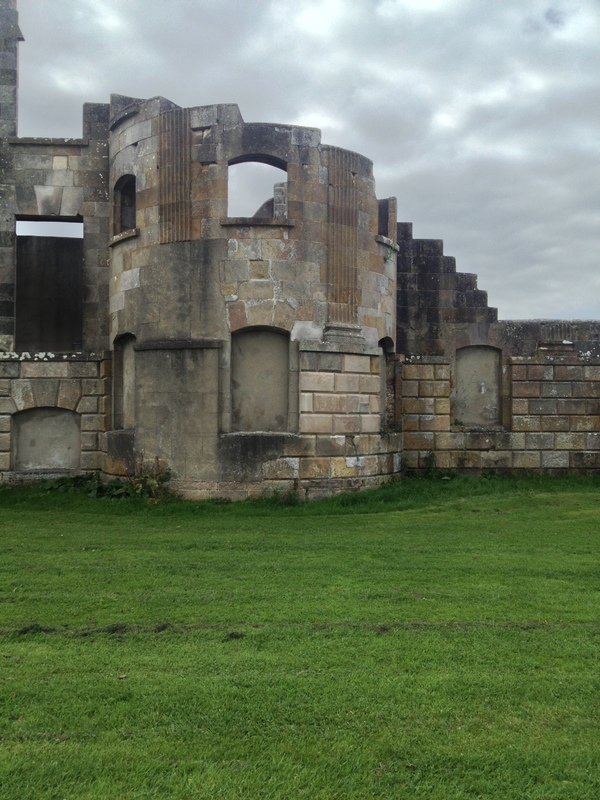 During the Second World War Downhill was used as a billet by the RAF and a few years into peacetime it was unroofed and permitted to fall into ruin. 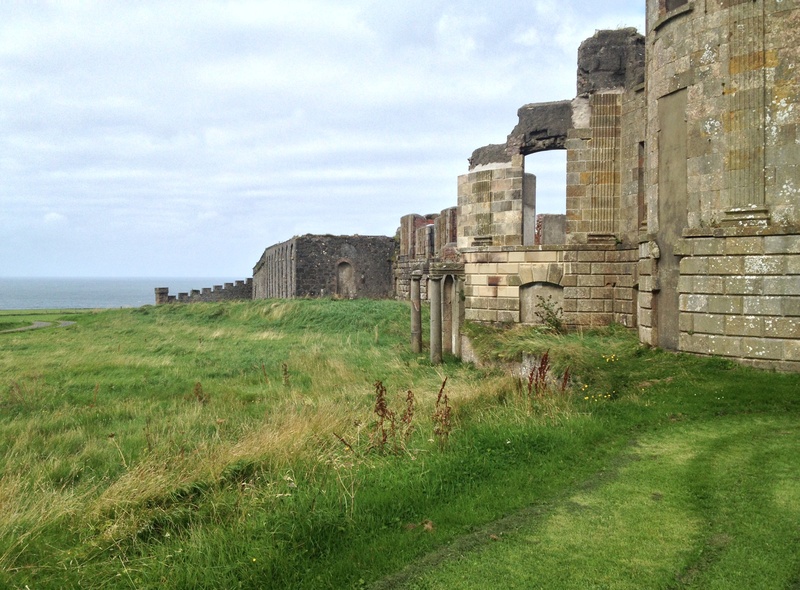 Now under the care of the National Trust, Downhill stands as a handsome if gaunt shell through which those harsh Atlantic winds continue to whistle. 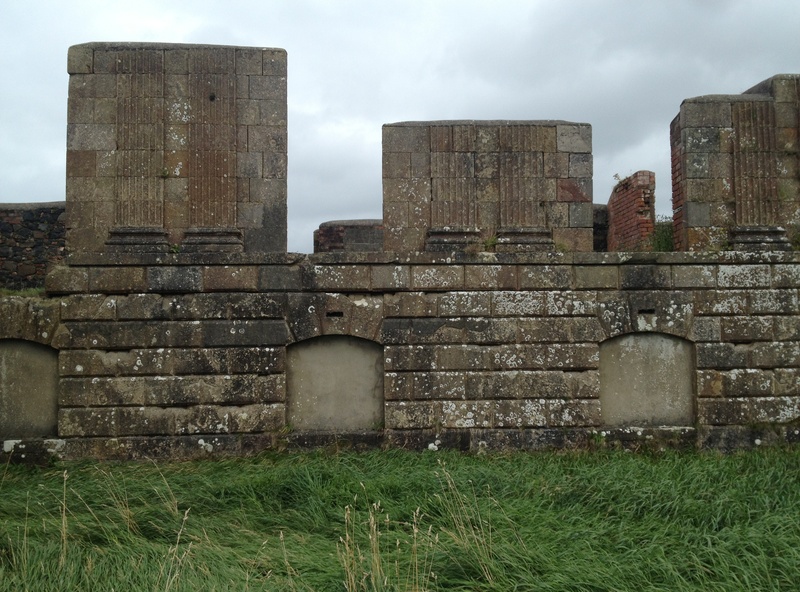 I shall at some future date be writing about both the Mussenden Temple and the Earl-Bishop’s other Irish house, Ballyscullion. 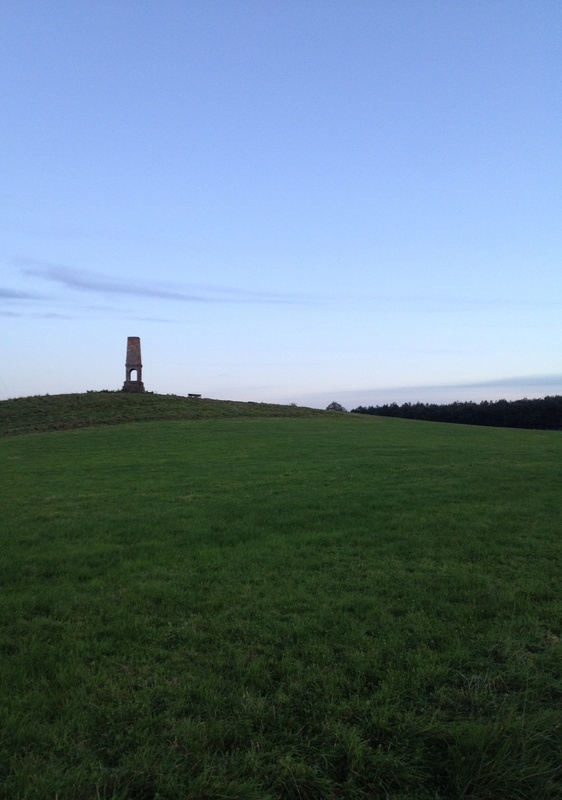 A solitary obelisk standing on raised ground in what was once the parkland of Dangan Castle, County Meath. Dangan was the seat of Richard Wesley, created first Baron Mornington in 1746. 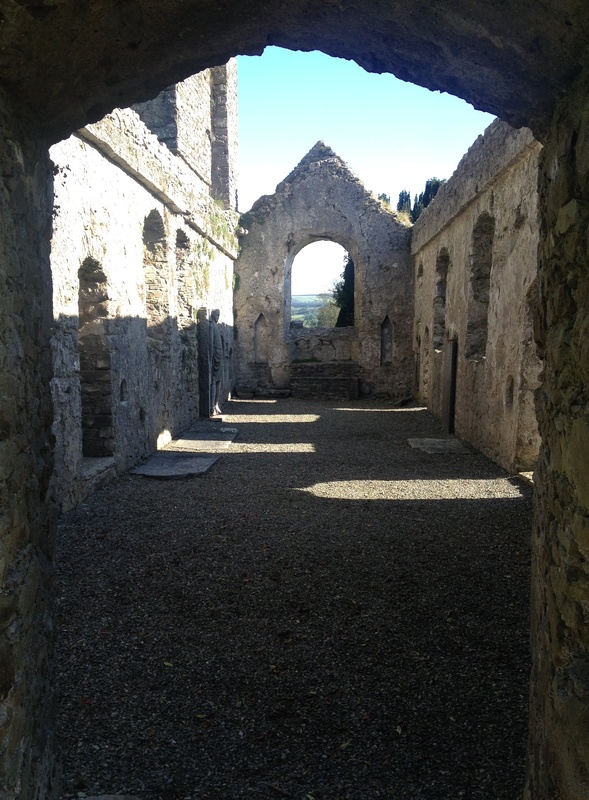 He spent a great deal of money improving his house and grounds, and Bishop Pococke in his 1752 Tour in Ireland described the former as being ‘situated on a most beautiful flat, with an Amphitheater of hills rising round it, one over another, in a most beautiful manner; at the lower end is a very large piece of water, at one corner of which is an Island, it is a regular fortification, there is a ship a sloop and boats on the water, and a yard for building; the hill beyond it, is improved into a beautiful wilderness: on a round hill near the house is a Temple, and the hills round are adorned with obelisks: Pillars and some buildings, altogether the most beautiful thing I ever saw.’ Mrs Delany also visited Dangan several times, being godmother to Mornington’s heir Garret, future first Earl of Mornington and, in turn, the father of Arthur Wellesley, future Duke of Wellington who likewise spent much of his childhood here. Yet before the end of the century the family had sold the estate, the house was accidentally destroyed by fire and in 1841 J. Stirling Coyne could write ‘The noble woods, too, which adorned the demesne, have shared in the general destruction; and all the giants of the sylvan scene have been prostrated by the ruthless axe.’ Today there remain few signs of Dangan’s former splendour other than this obelisk rising in the midst of a field, and another not far away, the latter restored of late with help from the Meath branch of An Taisce. 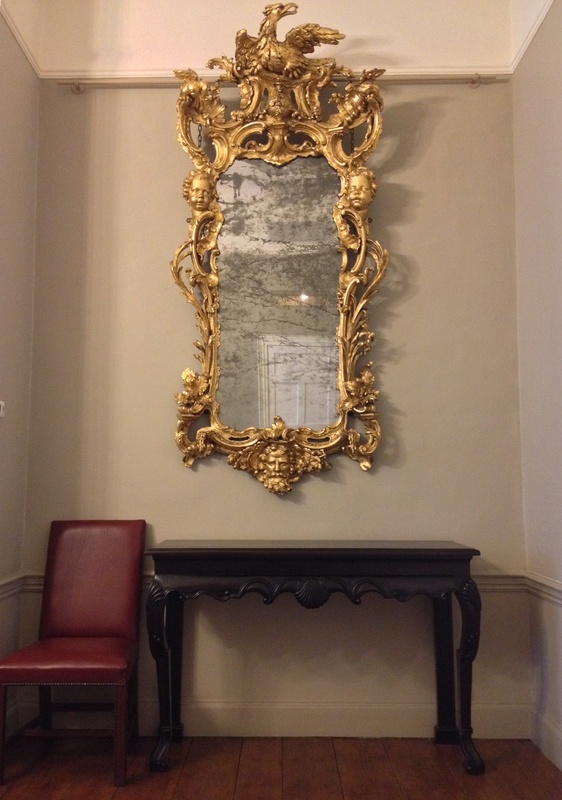 One of a pair of 18th century rococo gilt pier glasses that hang in the first-floor back drawing room of 5 Clare Street, Dublin, now used for board meetings by the National Gallery of Ireland. The two have belonged to the NGI since the early 1900s after being included in the Milltown Gift, that is the bequest made to the institution by Geraldine, Countess of Milltown following the death of her husband the seventh Earl. 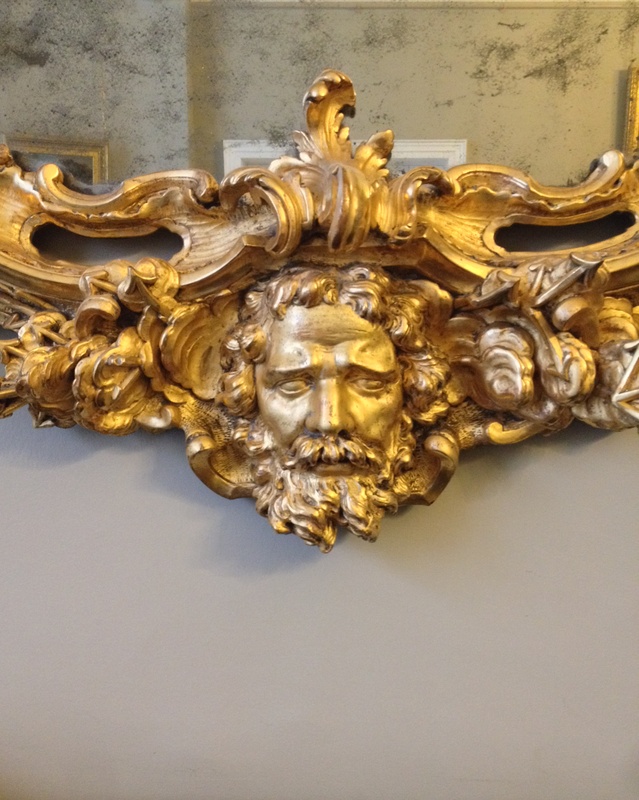 Previously the pier glasses had been part of the decoration of the saloon at Russborough, County Wicklow for which it is believed they were commissioned some time around 1750. 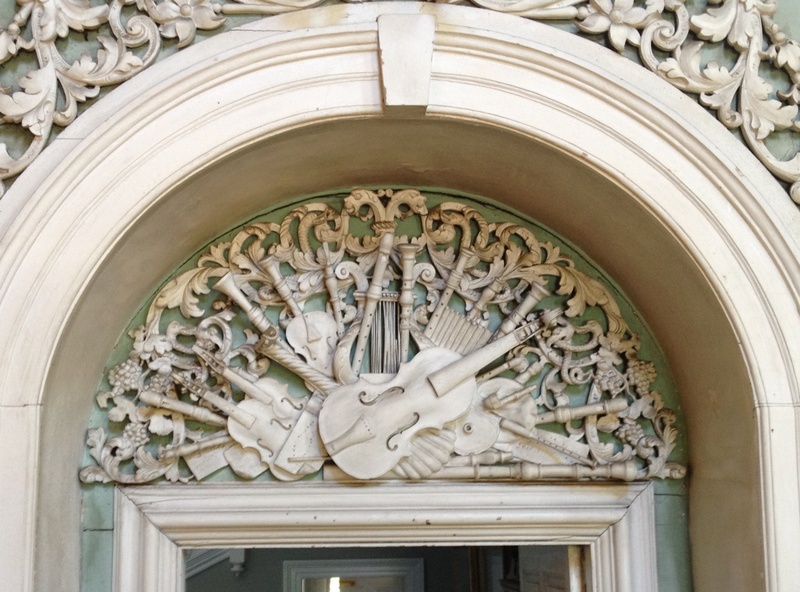 We do not know who was responsible for carving them, but the craftsmanship is certainly superb. When the Countess of Kildare visited in 1759, she reported to her husband that ‘the house is really fine and the furniture magnificent.’ Since much of that furniture was of similar calibre, her praise was more than justified. 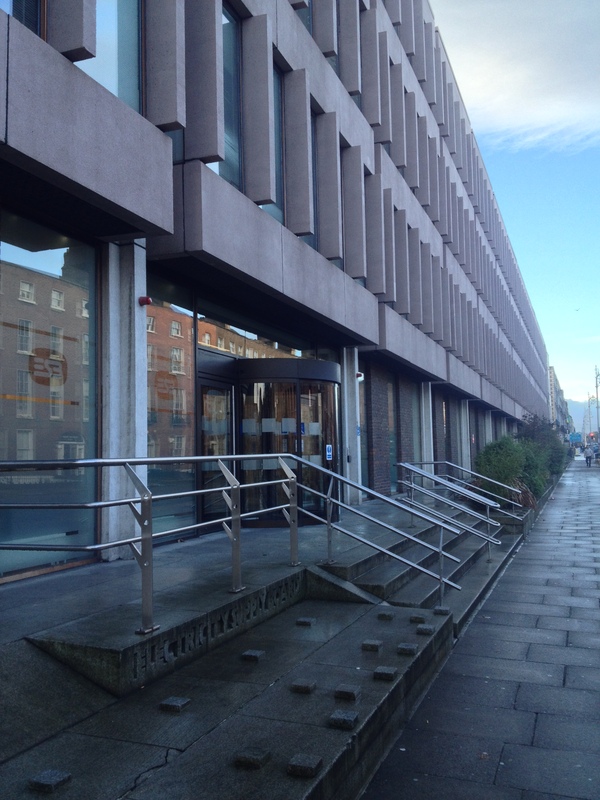 Ten days ago the state’s Electricity Supply Board announced plans to pull down its existing premises on Dublin’s Lower Fitzwilliam Street and build anew on the site. Since then there has been much discussion about what the replacement should look like. In order to assist in that dialogue, here follows a synopsis of how the present office block came into being. The ESB’s plans attracted widespread opposition, both at home and abroad, with The Manchester Guardian‘s correspondent asking ‘Is there a public opinion in Ireland sufficiently concerned to put a stop to this vandalism; and if not, why not?’ In an editorial on the same subject The Irish Times invited readers to ‘stand outside Holles Street hospital and look towards the Dublin Mountains. What would Canaletto have made of the view?’ A public meeting called at Dublin’s Mansion House attracted some 900 people, with 300 more having to be turned away at the door and therefore being denied the opportunity to hear the ESB denounced by the likes of actor Mícheál MacLiammóir and artist Sean Keating, then President of the Royal Hibernian Academy who warned that if Fitzwilliam Street’s destruction went ahead, ‘the next move will be to feed the books in the Library of Trinity College to the boilers of the Pigeon House.’ (Similarly in a report written by Dublin City Architect Daithi Hanly the question was posed ‘How important is the Book of Kells? At what price and for what convenience would we divide it and allow 16 pages of it to be destroyed?’). The audience at the Mansion House meeting also heard read the contents of a telegram of objection to the ESB’s scheme sent by the ground landlord of Fitzwilliam Street, the Earl of Pembroke whose forbears were responsible for the original development of the area. 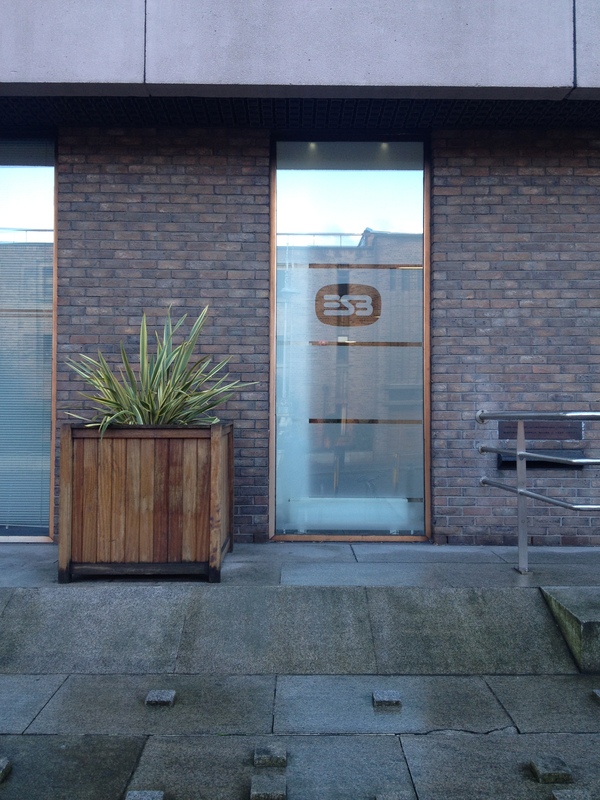 In an attempt to preserve the Fitzwilliam Street buildings, he now offered the ESB an alternative site nearby on James Street East. 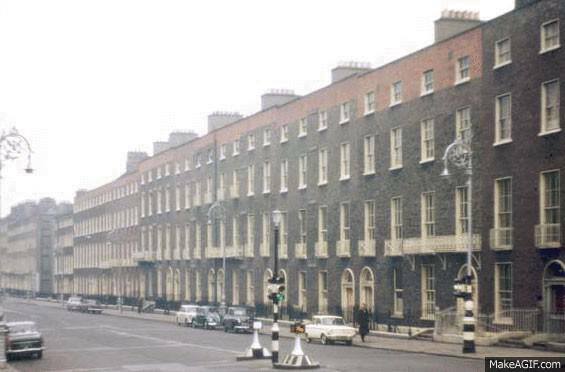 This proposal was not only declined but a compulsory purchase order was served on the Fitzwilliam Street houses, for which Lord Pembroke was paid a derisory £1,000; he immediately donated half the sum to the Irish Georgian Society to help its campaign. The battle went on for more than two years. 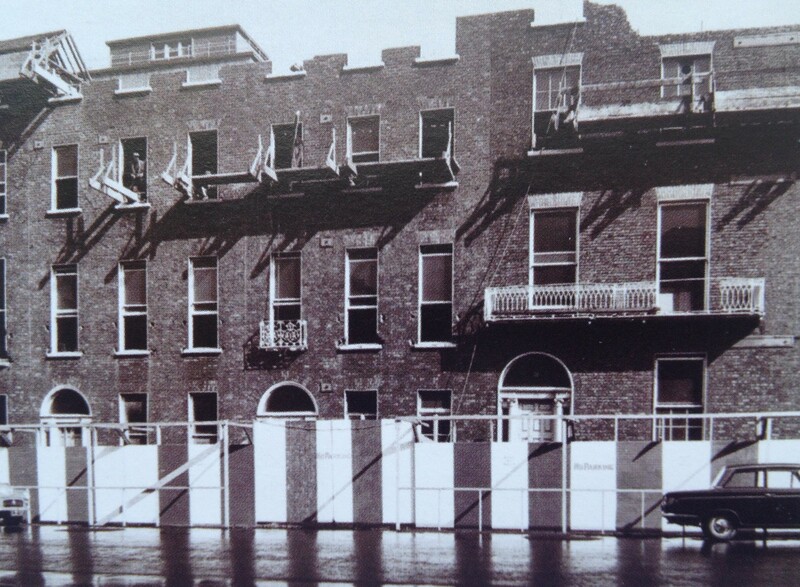 Both the IGS and the Old Dublin Society organised meetings and petitions against the ESB’s plans but no matter how much support they mustered or how vocal their objections it made no difference, not least because the Government of the day had no objections to the buildings’ demolition but instead gave support to the proposal. In late September 1964 on the very day before a new Planning Act – which could have provided salvation for the old houses – came into effect, then-Minister for Local Government Neil Blaney signed an order granting full planning permission for the new office development on Lower Fitzwilliam Street. The timing was surely no accident, and sealed the buildings’ fate. The following summer the sixteen houses were knocked down and work began on their replacement which ever since has continued to disrupt the unity of the area’s layout. Thus we come to the present situation where the block commissioned by the ESB half a century ago has now been deemed unfit for purpose and only good for demolition. There was no need for the ESB to remain in this location in the 1960s and there is no need for it to do so today. On the contrary this is an ideal opportunity for the company to move out, allowing proper redevelopment of the terrace as a series of residential units. 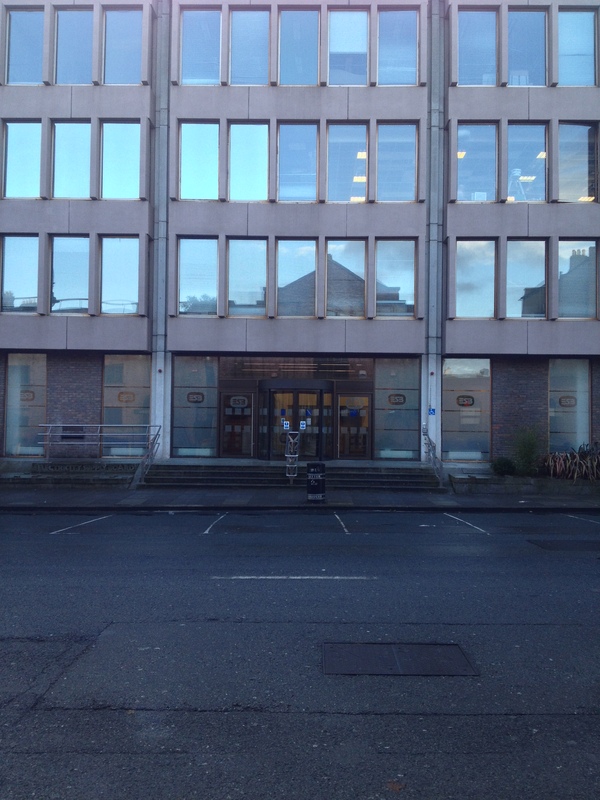 Instead, it has continued to acquire property in the area and commissioned a replacement of the Lr Fitzwilliam Street block from Grafton Architects and O’Mahony Pike. In no circumstances can the current building be declared an object of beauty but nor is its proposed proposed successor. 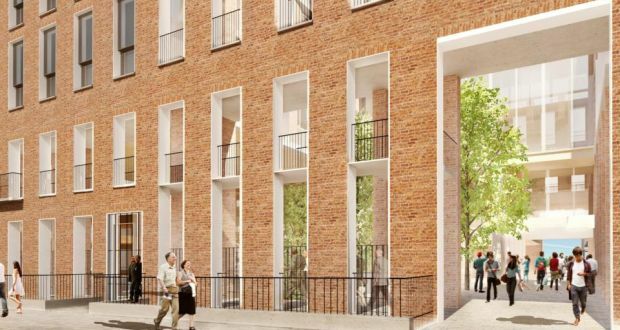 The design is, quite frankly, a piece of poor pastiche: it acknowledges the authority of the original streetscape but then insists on fiddling with details of the buildings in a facile manner by playing around with window and door heights. The result suggests the architects, while accepting the power of the past, are nevertheless desperate that their interpretation, no matter how weak, receive some notice. At the time of the old buildings’ demolition, Build magazine predicted, ‘If the ESB’s victory fires the starting gun for a wholesale onslaught on the remaining splendours of the eighteenth century, then it will be a victory most Pyrrhic indeed for the city of Dublin.’ And so it came to pass: where the ESB led, dozens of other state and private organisations followed and terrible destruction was wrought across the capital. 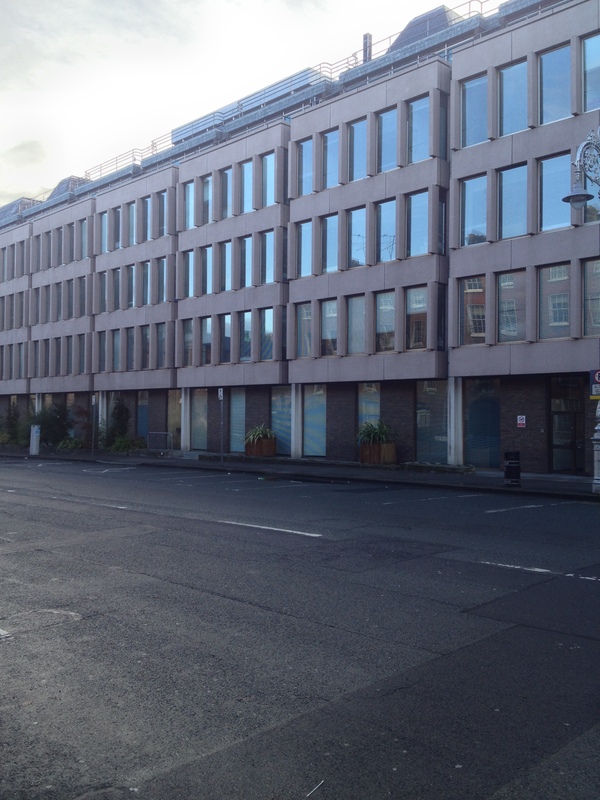 It is surely telling that today Dublin City Council wants the lost facades to be reinstated, a huge change in attitudes over the past half-century. But one thing remains the same: the inability of corporations and individuals in Ireland ever to admit a mistake has been made. The ESB wouldn’t accept it was wrong then, and it won’t accept it is wrong now. Instead the company has declared its hand and shown the course intended to take: no matter how fierce the opposition, be prepared for the ESB to resist any change to announced plans. 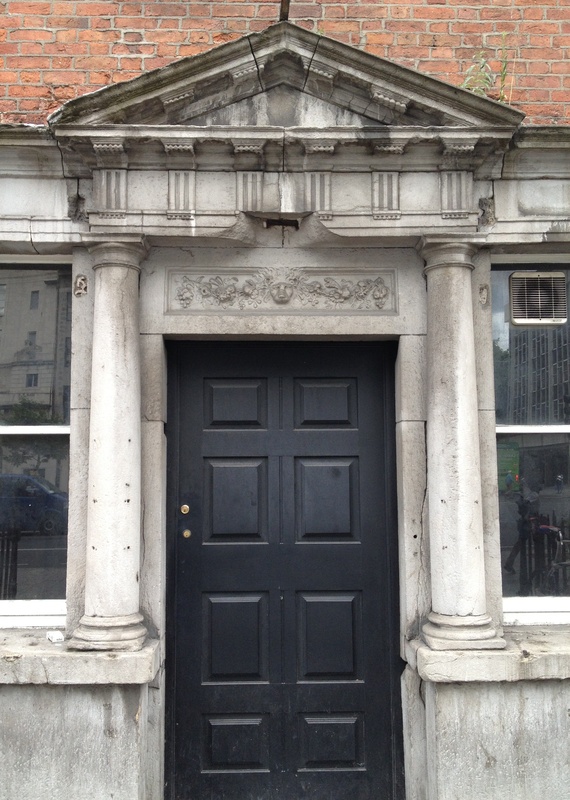 The entrance to the last remaining 18th century house on O’Connell Street, Dublin. Set in the red brick façade, No. 42’s limestone door case has a handsome carved tablet centred on a lion mask not unlike those one finds on Irish mahogany tables of the period; the lintel above has been damaged for as long as I can remember. On a site leased in 1752 to Robert Robinson, State Physician and Professor of Anatomy at Trinity College, the building appeared four years later on Roque’s map of the city. The first floor contains a fine room to the front with very pretty rococo decoration on its ceiling. The Irish Aesthete usually features houses that are somewhat larger than average but this week, by way of change, we turn our attention to a building of decidedly modest proportions. The townland of Ballilogue in County Kilkenny enjoys likewise humble status, located down a laneway with seemingly little to distinguish it from thousands of similar spots across the country. Also like so many other places, it was once more densely populated than is now the case. The 1901 national census records twenty-two houses in the townland, presumably all of them simple dwellings unremarkable except for the number of occupants. In one of these properties, for example, Cornelius Meaney, then aged 59 and one imagines a widower, lived alone. Not far away dwelt another member of the family John, together with his wife Bridget and their two sons, James and John aged two and one respectively. Ten years later, when the next census was taken, the household of Cornelius (now listed as being 70) had grown considerably: his 74-year old sister, another Bridget, lived with him, as did the younger Bridget by then the mother of seven children, the eldest (James) being twelve and Mary the youngest just three. Either her husband John had died in the meantime or had gone elsewhere in search of work to support his family. So the house where Cornelius lived alone in 1901 had eleven occupants in 1911, since the census also records the presence of a 29-year old servant called Michael Dunne, presumably a farmhand. By the 1911 census the number of occupied dwellings in Ballilogue had halved to eleven, with sixty-eight people living in the townland. A number of them were further members of the extended Meaney family, including 54-year old Patrick, together with his wife Mary, their five children and Edward Flynn who, although aged just fourteen, was already listed as being a ‘servant.’ All eight lived in the house shown here, the origins of which are believed to date back to the 1700s although subject to many changes since. 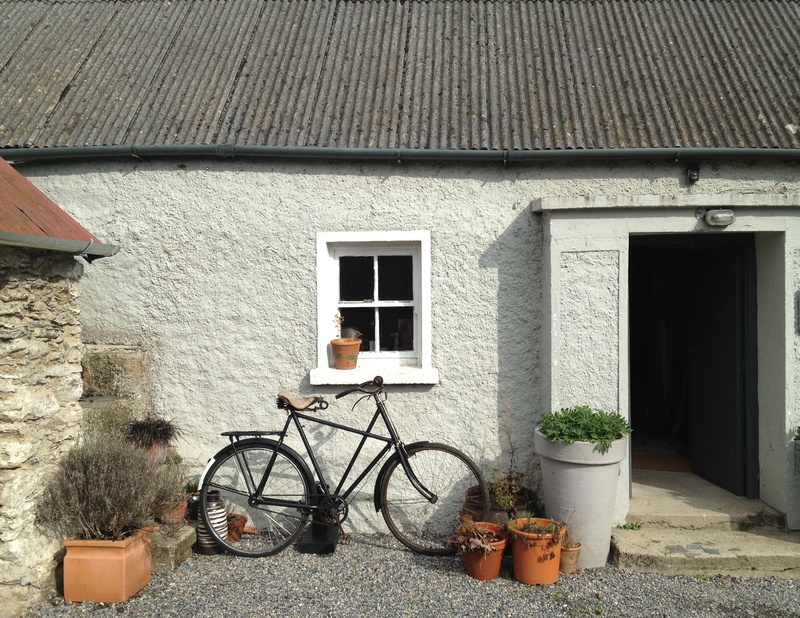 In her truly excellent 1993 book on Irish Country Furniture, Claudia Kinmonth notes ‘By the nineteenth century in Ireland, the term cottage was used disparagingly, mainly by visiting English. The term is not used in this text as it was considered derogatory by country people, who called their homes houses, regardless of size and status.’ Accordingly we shall here refer to the Meaney House, not least because so it remained until only ten years ago, inhabited by successive generations of the same family before being acquired by the present owners. To quote from another splendid book, A Lost Tradition: The Nature of Architecture in Ireland written by Niall McCullough and Valerie Mulvin in 1989, typical Irish houses in the vernacular style ‘have a familiar character, cramped, linear spaces set out on a line of doors without beginning or end – in the manner of a Baroque palace with its rooms en enfilade.’ That link between Baroque palaces and humble Irish dwellings may seem fanciful, yet it is often the case that even the most unpretentious of houses derives inspiration from a grander type. McCullough and Mulvin continue by observing how these little buildings ‘have a natural classic balance in the arrangement of simple materials and structure, in the proportion of gables, the relationship between thick white walls and small square windows, in the heavy oversailing roofs and primitive trabeaten doorways.’ This perfectly describes the character of the Meaney House, which is typical of the dwellings occupied by the majority of this country’s population for hundreds of years, although compared to many of the others it can be considered relatively large and well-appointed. Traditional house types differed somewhat across Ireland, not least according to whatever materials were available for their construction, and how prosperous was the region. 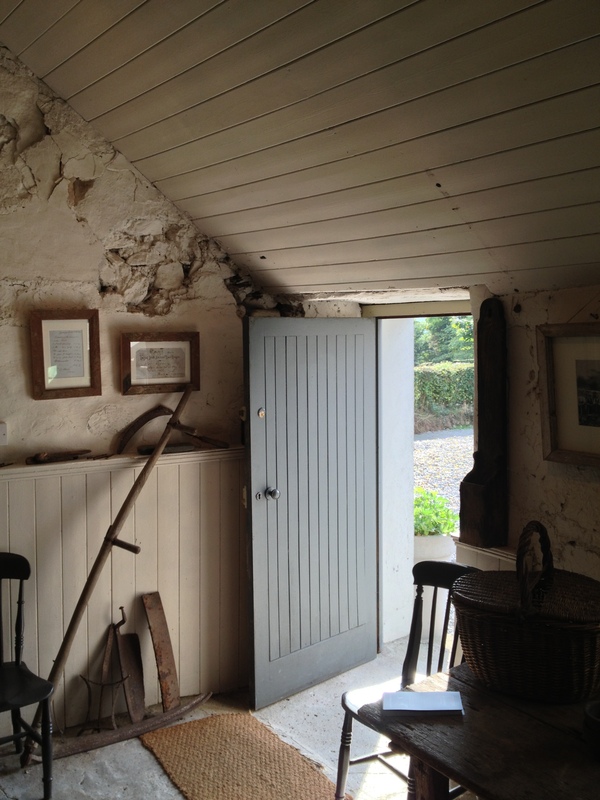 With regard to this part of the country, the Meaney House displays some familiar features of the Irish domestic dwelling, beginning with an entrance placed at the centre of the front and given a small porch in order to shield the interior from the worst effects of our weather. One then steps straight into the main space which, as was almost always the case, is dominated by a large hearth. This was used for cooking purposes (note the crane which allowed kettles and pots to be swung over the fire) but also provided a focal point for sociability: residents and visitors alike gathered here and the large recess beneath a hooded canopy supported by a massive beam running the width of the house allowed everyone to enjoy additional warmth. Immediately behind this is the house’s best room, the equivalent of a parlour, often kept for use only on special occasions and in the Meaney House distinguished by having a cast iron chimneypiece. On the other side of the central room are two bedrooms, with a ladder staircase in one providing access to another sleeping chamber immediately beneath the roof. Another common feature of these houses was the versatility of their furnishings. Because space was at a premium and occupancy levels high, very often items served several purposes. The most obvious example of this is the settle bed, which acts as a bench during the day but then at night the seat can be opened, the bedlinen stored inside spread out and a place for sleep thereby created. 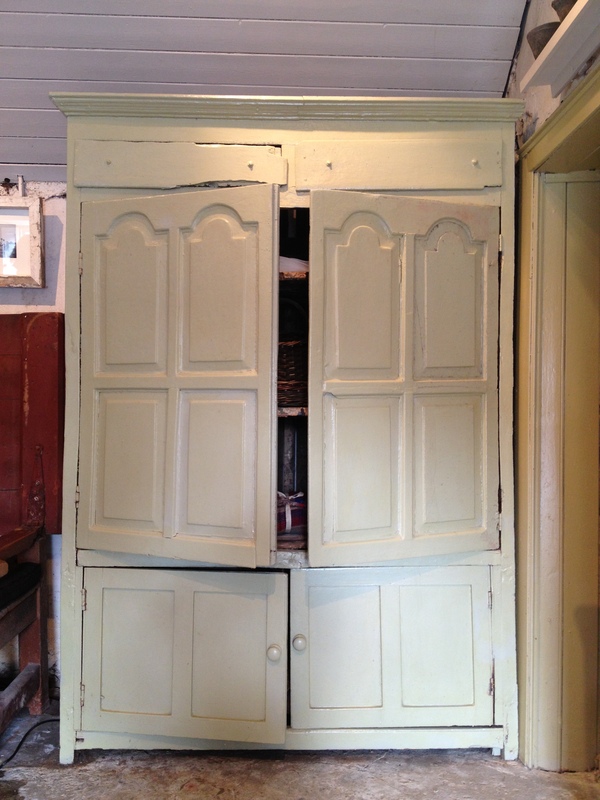 Dressers, on which china, kitchen and dining utensils would be kept, might have a lower section open except for a series of bars: chickens would be kept here at night to keep them save from predators. A side effect of this was that hens, benefitting from the warm environment, continued to lay eggs all winter. 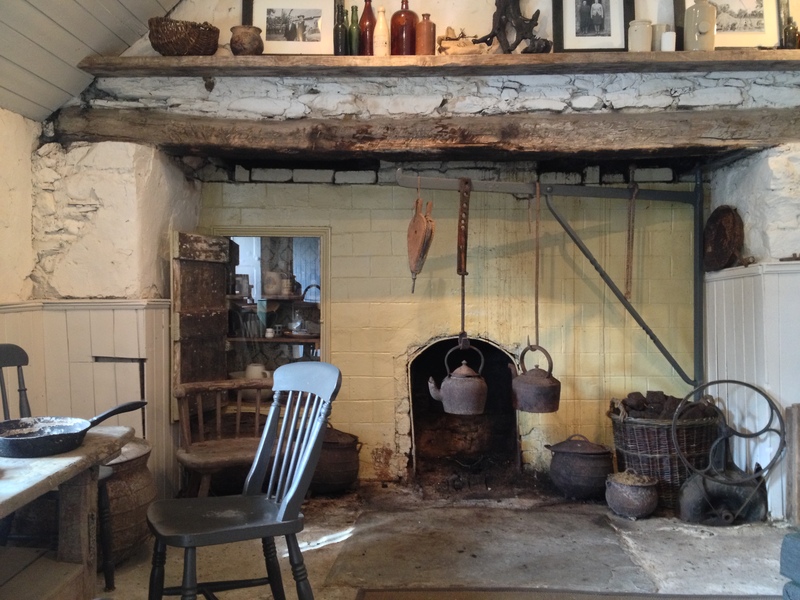 Inside the Meaney House, as these pictures show, recesses in the walls were also used for storage, the doors’ interiors lined with pieces of patterned paper: those close to the hearth would often hold food that needed to be kept dry, such as tea, sugar and salt. The utilisation of every available space emphasised utility and frugality, but also a desire to maximise comfort in our relatively harsh climate. Today the Meaney House is part of a larger agglomeration of buildings restored and developed by the present owners as a retreat where guests may come to stay. 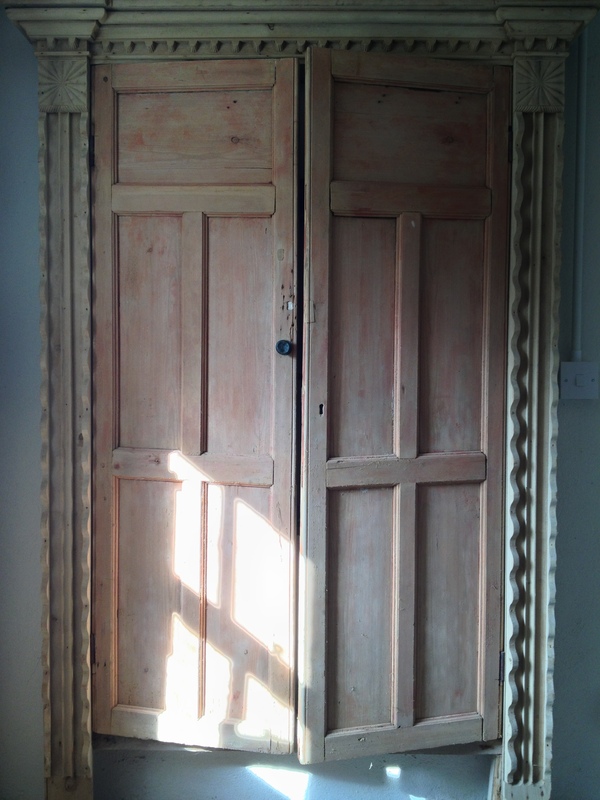 When they acquired the house, it still held the greater part of the former owners’ possessions and a decision was taken to retain them in situ and to preserve the interior as an example of how most of our forebears lived until relatively recently. 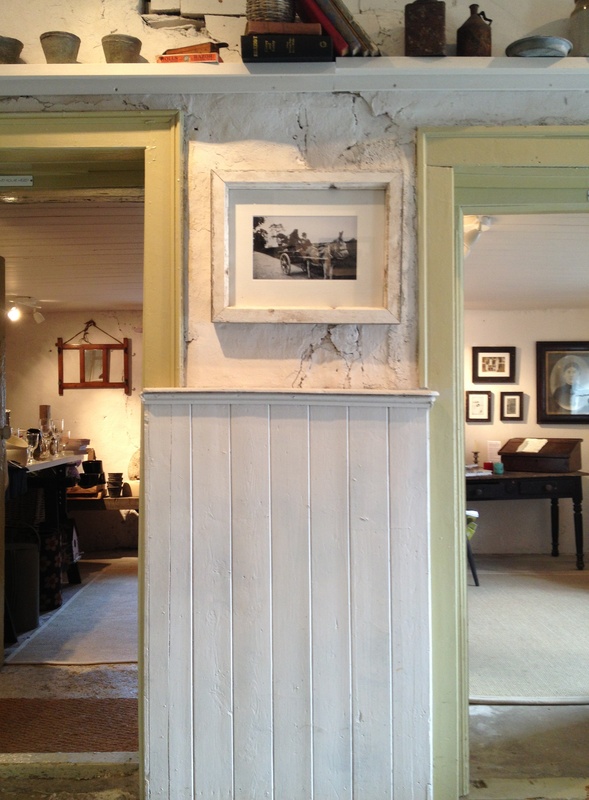 As little as possible was done to disrupt the building’s character or to alter its accumulated patina. For example the corrugated roof, certainly a 20th century intervention under which the older thatch still survives, was not changed. 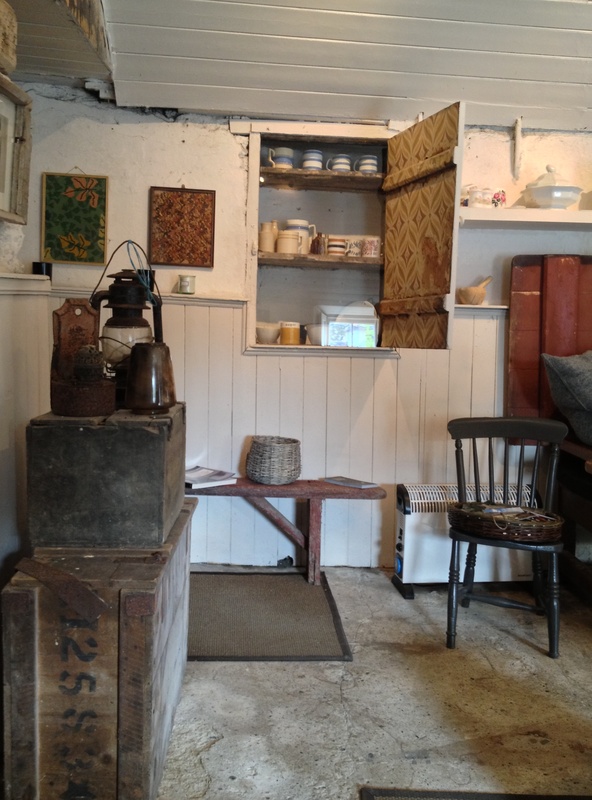 Similarly inside the house the concrete floor – again probably laid at the start of the last century as it would previously have been just compacted earth – has not been touched. 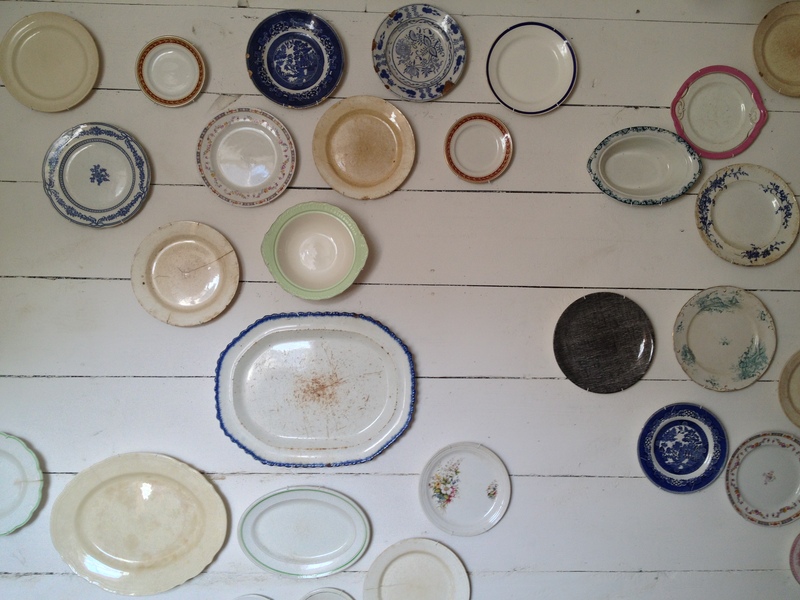 The old pieces of furniture remain in place, as do most of the household goods and so forth. 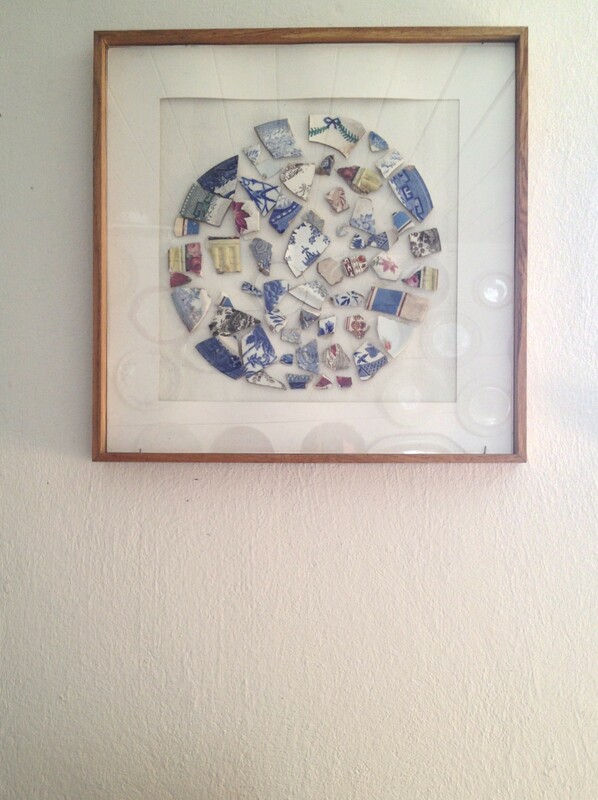 Some pieces previously kept out of sight are now on show: plates and platters have been arranged on one of the bedroom walls while pieces of broken china discovered in the immediate vicinity are arranged in a circle and framed. 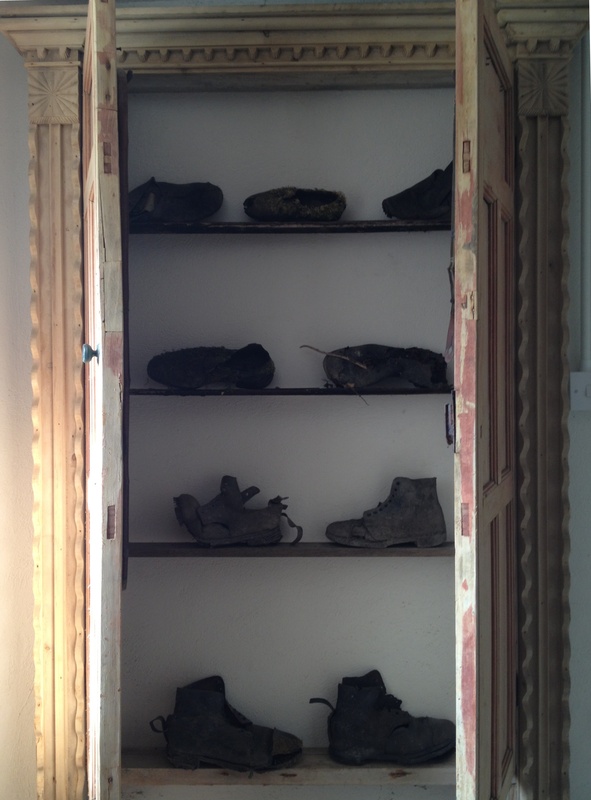 Likewise an assortment of abandoned footwear found outside has been placed on the shelves of an old pine hanging cupboard. These pieces, literal objets trouvés, further enhance the experience of visiting this little house and improve our understanding of its former residents. 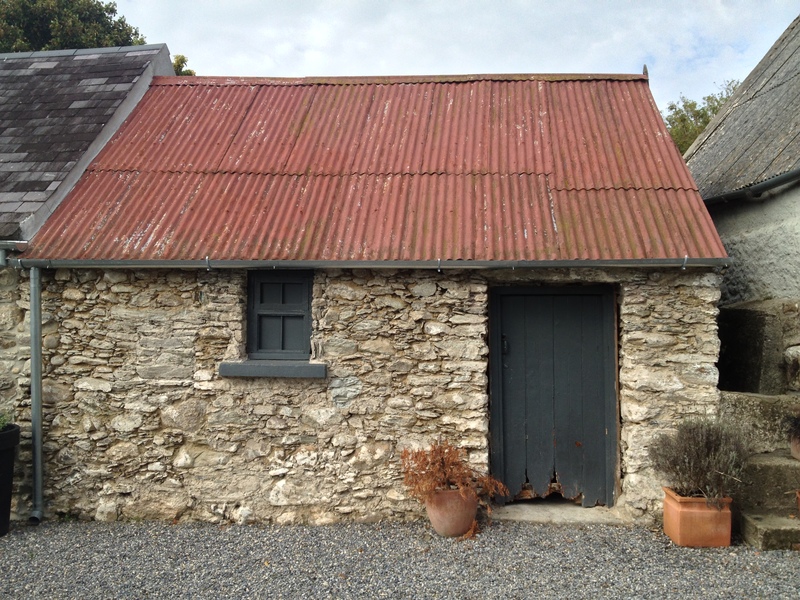 The Meaney House demonstrates that despite their poverty our ancestors could build with superior taste and a better understanding of the Irish environment than is usually the case today. I am delighted to advise that last night The Irish Aesthete was declared Ireland’s Best Arts & Culture Blog 2013. Many thanks to those awarding the titles and also to all readers whose encouragement and interest are always so appreciated. 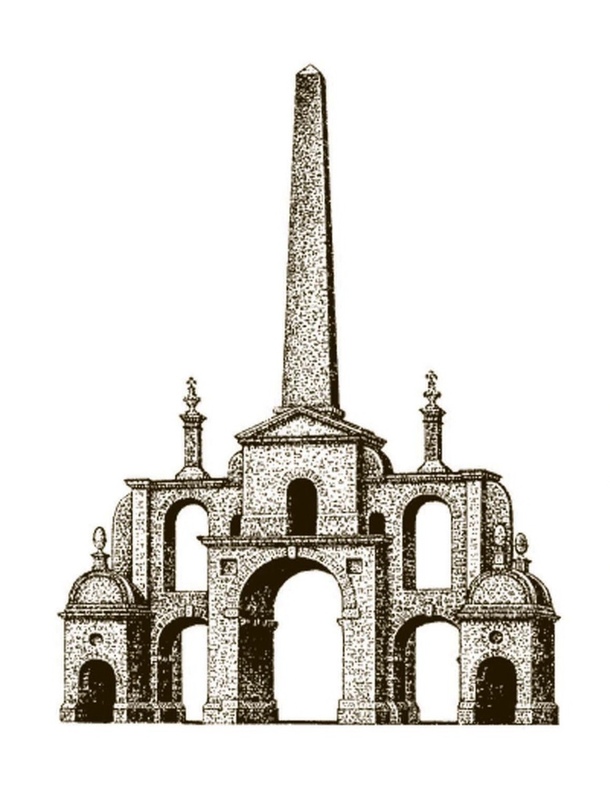 The accompanying illustration depicts the Conolly Folly, designed by Richard Castle and built at the request of the widowed Katherine Conolly in order to provide relief to the local poor during he famine of 1740-41. 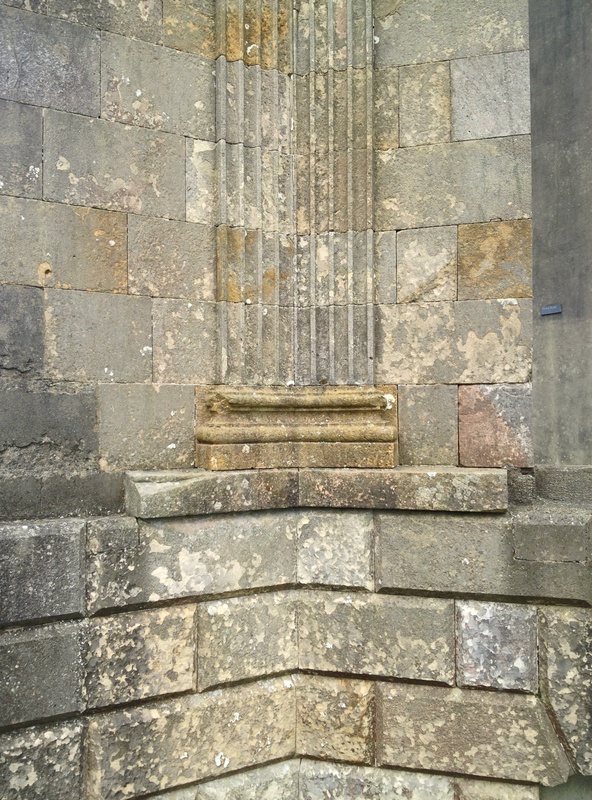 It is, of course, also the symbol of the Irish Georgian Society. Dating from c.1816 this watercolour is deemed to be J.M.W Turner’s only Irish view and shows Clontarf Castle, County Dublin. The picture was painted for one of the artist’s closest friends, Walter Fawkes of Farnley Hall, Yorkshire who owned a large collection of Turner’s work. 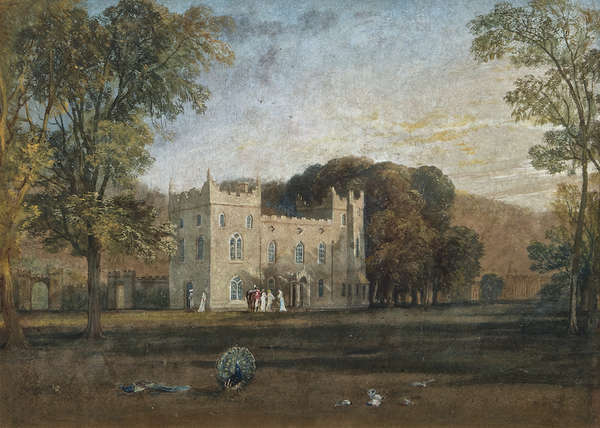 The watercolour is of particular interest because Turner never visited Ireland and therefore must have been working from an image of Clontarf Castle produced by someone else; the connection is that Fawkes’ second wife Maria Sophia Vernon – who he married precisely around the time this watercolour was produced – had grown up at Clontarf Castle, so presumably it was intended to act as a souvenir of her childhood home. Twenty years later the building, originally constructed in the 12th century by the Knights Templar and acquired by the Vernons in the second half of the 17th century, was very extensively remodelled by William Vitruvius Morrison at the request of Maria Sophia’s nephew, John Edward Venables Vernon. Thus the picture also serves as a guide to what the house looked like in its earlier incarnation. 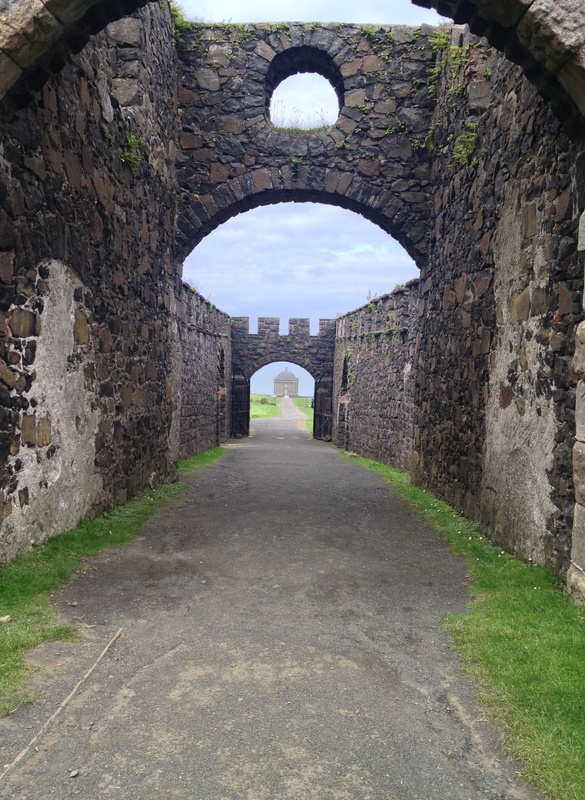 Today Clontarf is a suburb of Dublin and the castle, greatly enlarged, an hotel. 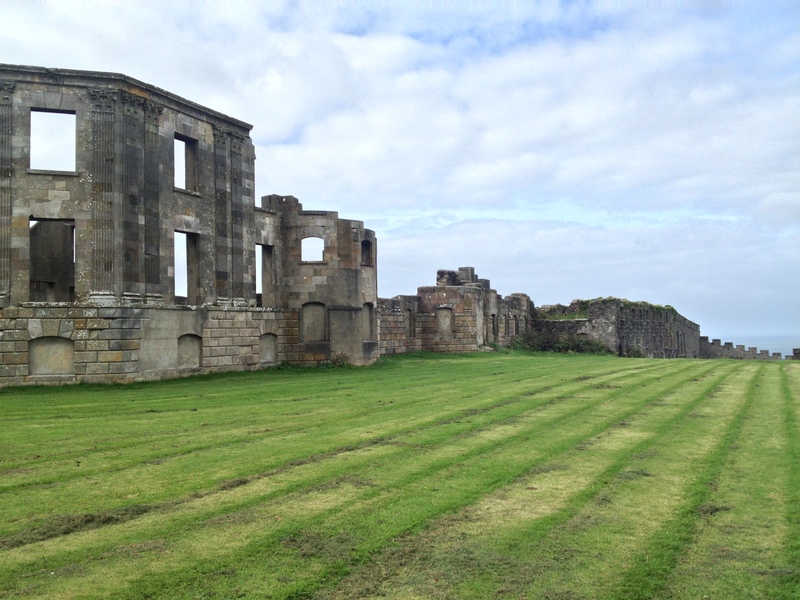 It is possible to gain a sense of what the building and surrounding lands were like a century ago by reading ‘A Georgian Boyhood’ the third part of Cyril Connolly’s wonderful Enemies of Promise published in 1938. His mother was a Vernon and he therefore spent holidays as a child in the house. Estimated to fetch €20,000-€40,000, the watercolour is due to be auctioned next Monday by Adam’s as part of its country house sale at Slane Castle, County Meath (see: www.adams.ie). Update: the Turner watercolour of Clontarf Castle sold for €65,000.